Tom Kha Gai – literally, Chicken Galangal Soup – is a coconut-based Thai soup famed for its subtle sweet and sour flavour profile. 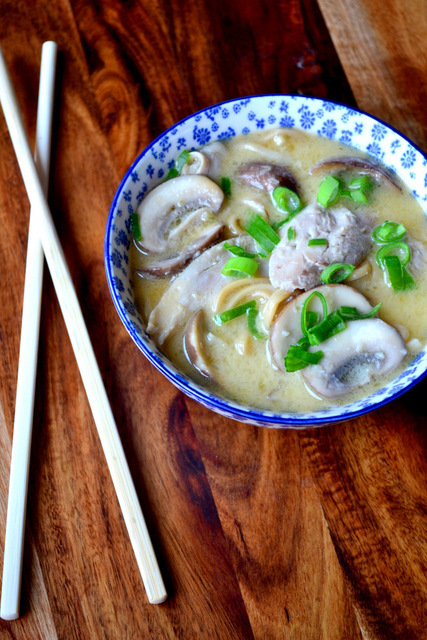 Though usually eaten as a curry – spooned onto rice – tom kha gai also works well as a noodle soup; the form it takes in the recipe below. Featuring many quintessentially Thai ingredients – galangal, lemongrass, lime leaves and coconut – tom kha gai has become a frequently-visited dish in Thai restaurants. A well-balanced soup, it is incredibly accessible, especially for those who aren’t such a fan of the heat the cuisine is renowned for. Though most recipes would tell you to substitute ginger for the galangal if you aren’t able to find the latter, I suggest otherwise. Their flavour may be roughly similar, but if you do a direct comparison you’ll find it easy to tell the two apart. Use ginger in this recipe and you risk drowning the delicately balanced soup in a flavour that shouldn’t rightly be present. If you can’t find galangal simply omit it from proceedings. 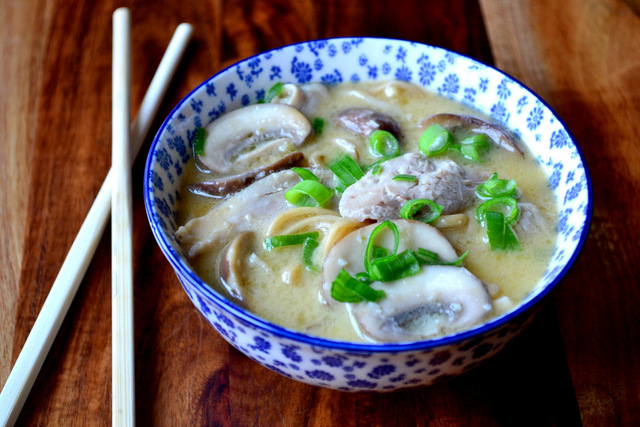 You may not achieve quite the right effect, but at least your tom kha gai won’t be ruined. The amount of chilli and fish sauce used below is best described as moderate. If you enjoy heat or the rather unique flavour of fish sauce feel free to be a little more liberal with both. In fact, it’s not uncommon to find three tablespoons of fish sauce in a tom kha gai of this size. Like my recent recipe for Chicken Chow Mein and older rendition of Fragrant Chicken Biryani, this recipe for tom kha gai is an excellent way to use up leftover roast chicken. Naturally, using leftover chicken has the added benefit of reducing the cost of the dish. Using a food processor, blend together the shallots, lemongrass, garlic, chillies and galangal until you have a paste. Add a little water if necessary. Heat 3 tbsp of the sunflower oil in a wok until smoking. Quickly stir fry the paste before adding the coconut milk, lime leaves, fish sauce, palm sugar and chicken stock. Reduce to a medium heat and leave to simmer. Meanwhile, heat the remaining oil in a separate wok or frying pan and stir fry the mushrooms and chicken pieces on a high heat. Cook for 4-5 minutes and set aside. Prepare the noodles by bringing them to the boil in a saucepan, cook until al dente. 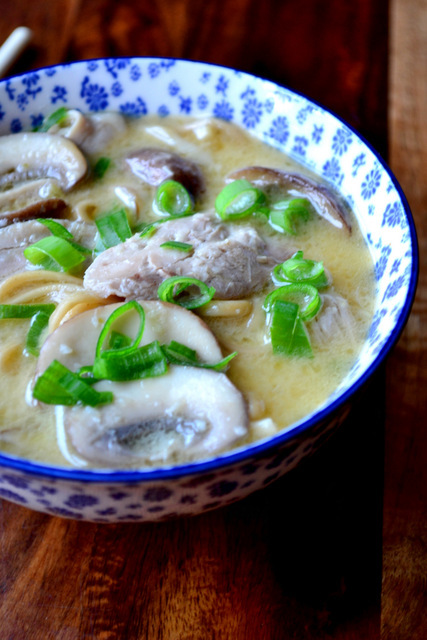 Add the mushrooms, chicken, salt and noodles to the coconut soup and simmer for a further 2 minutes. Serve in large bowls, topping each with a little lime juice and a sprinkling of finely sliced spring onion. 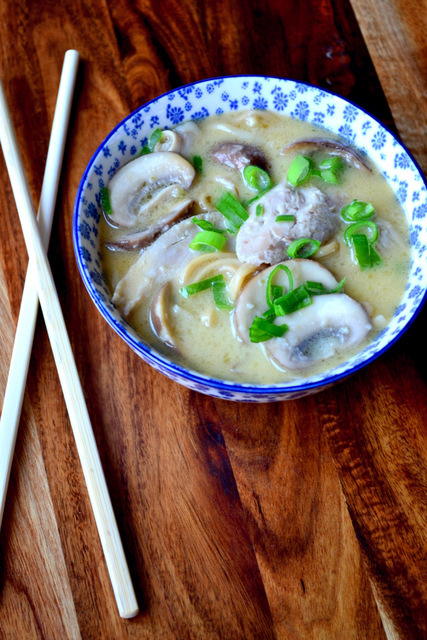 Cost: Ingredients used in recipes like this tom kha gai are usually relatively inexpensive. Including chestnut mushrooms – as opposed to shiitake oyster – and leftover roast chicken brings the cost down further. As such, this meal for four can be made for as little as £4.20. I hope you enjoyed it, if you made it. It’s such a simple dish. A lovely ‘soft’ version of a crowd pleaser always 🙂 ! wow, I would never be able to find some of those ingredients in stores, but will see if I can get them online. looks great!! I hope you can – they can be hard to find, but we have a few Asian supermarkets nearby. I am going to try! coincidentally I bought a can of this soup the day before reading this post!! You can buy tins of it there? How odd – I’ve never seen that here. Our family love love loves Thai food. I’ll have to see if we have the galangal root here, it’s so annoying to not have such varieties of ingredients in Calgary. We’ve only recently got lemongrass, I guess I just have to keep asking and they’ll start bringing it in. What a lovely warm soup for our cold winters! I have my fingers crossed for you, Barbara! Luckily ingredient variation seems pretty good in Britain; you can get almost anything if you know where to find it. Thank you! I did – it was deeeelicious. Similar to my homemade coconut “no curry” chicken soup, this seems delicious. When I try it, I will replace the noodles with rice (if add any, at all) and omit the mushrooms, replacing with another veggie or two instead. For my personal needs I have to avoid nightshades like peppers and chiles, and keep mold/fungus/yeast to a minimum for the sake of my sensitive digestion.